My name is Bridgette Harwood, I have been a riding instructor since 1995 and started training horses in 1998 in Suffolk County, Long Island. My interest in horses and in particular the relationship and communication between horse and rider goes back as long as I can remember. My method for training students to ride is based on the curriculum taught at the Spanish Riding School. In particular, the curriculum based on mastering the body for seat, balance, control, and fluency. I have found that this method creates beautiful riders that understand how to use their body to its utmost potential, influencing and not influencing the horse; as both are a great tool for training. I believe in teaching students (even the very young ones) how to train horses and not just ride well. I will often use a horse that is green in a certain area in order to teach the student how to go through the steps to communicate something new to the horse. I believe that this method not only makes for a better rider, but more importantly, makes the student become extremely aware of their horse. Thus learning to train through the mind of the horse allowing its body to follow (unity) and not by forcing the body causing conflict of the mind (disunity). This kind of training also creates a real appreciation and partnership for both the horse and the rider. In this area of my teaching I use natural horsemanship techniques to teach, some of which have been recorded as far back as the 4th century B.C. even before writings on dressage. I myself have learned primarily from John Lyons, whose methods truly are non-resistant, meaning the rider does not force or trap the horse into doing the right thing (which causes fear). I believe that using what's natural to a horse to teach him to understand and give full attention to the rider, can only be achieved when the rider has good control over their mind and body, has absolutely no anger, and can communicate without causing fear or using force which takes away all beauty. The more knowledge we have of how horses think, the more we can use that to better our training. The horse is in fact the master of teaching us how to ride it truly well. 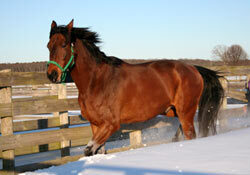 As a trainer and teacher I try to preserve the natural spirit, beauty, and communication of the horse. I always try to improve myself and my students in the beautiful art of riding these magnificent animals. "Most riders I meet have been riding for years and often started riding as a child. Being a late starter (over sixty), was going to present a whole set of challenges. Bridgette was up to the task when she first started teaching me to ride three years ago. Her patience, gentle approach, ability to understand both me and my horse and her sincerity in wanting us both to succeed are what all kept me coming back week after week. I spent a lot of time in corners with Duke - not understanding why this big gentle giant wanted to torment me when all I wanted to do was trot off into the sunset. Bridgette kept me challenged and encouraged through her many different ways of explaining what was needed to obtain the desired response from Duke. We then added Rocky into our little “herd”. Rocky is big, fast and lanky and I am short, light and not very fast – to include at catching on to steering, halting and being a good listener. Bridgette persevered week after week, never letting me give up on myself. We now are cantering and posting and I am living my dream. Bridgette continues to train all of us and we continue to improve. On a scale of 1 – 10, Bridgette is an 11 not only as a riding instructor and horse trainer but as a person. Her quiet confidence and ability are apparent both to horse and rider, and the difference she has made in my life is beyond defining. Let’s just say that she has brought out the inner child and added another thirty years to my life. As for Duke and Rocky, they are enjoying the good life and other than me (who provides food, shelter and lots of love), Bridgette is their best friend. How many horses can say that about their trainer?" 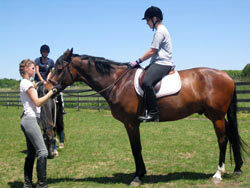 "Bridgette has helped me tremendously with three different horses. She first helped me with my 1st horse on lunging. My second horse was a rescue. I could not have done anything with him without her help. We worked on the ground and then on riding him. She even took him into the park with and without me to try to see how he was. Unfortunately, it did not work out. She was the first person to tell me, that he was not for me. I now have a wonderful rideable horse that Bridgette worked with us on the ground, ridding and now the park. She continues to train her for me in the park while I am working. Bridgette has so much patience and understanding of Natural Horsemanship. I have learned so much from her and would not be where I am now in my ridding without her." "Did you ever see someone who could ride a dinosaur with grace? Well I have. I have watched Bridgette Harwood train for years on all different kinds of horses. I've seen her take a seventeen-hand, green horse and saddle break him to a gentleman and take a frightened rider and bring them to a nice comfortable place in their riding. She has the experience and the training that can improve "Horse and Rider" at any level, on horseback and even on the ground. I know this because I have watched her train horses for years as well as coach students who are trainers today. My daughter and I have been training with Bridgette since 2002 and have grown tremendously with her. As for myself, I was that frightened beginner at the age of thirty six when I started to ride again after a bad experience. If it wasn't for my training with Bridgette I wouldn't be where I am today which is a nice comfortable intermediate rider at the age of forty four years old enjoying this beautiful hobby for myself and smiling all the way! As for my daughter Samantha, she started when she was ten years old and is now an advanced rider at the age of nineteen who has placed several times on her hunt seat equestrian team at college. Ironically, when the coaches discovered that Samantha did not ride within "a rated English show circuit" (so to speak) on Long Island they were skeptical about putting her on the team until they saw her ride! They couldn't believe the control, seat and knowledge she compared to girls who've done the circuit. They put her in and she placed second in her first IHSA intercollegiate horse show. After that her coach said she will be showing every show thereafter! Samantha also rides Western, does Barrels and does Team Penning just for fun. Oh by the way, did I mention we now are proud horse owners."